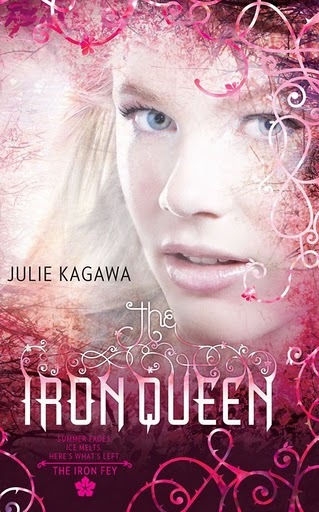 While The Iron Queen was not my favorite book in the Iron Fey series, it was still a good read. The Iron Daughter was the best in the series to date for me, namely because I did not like the ending of The Iron Queen. Meghan grows up a lot in this book. Gone is the naive human of The Iron King. In her place is a strong, determined heroine who goes after what she wants and what she knows is right. It was great to read about Meghan's strength of character and sureness in her decisions. She starts putting the good of others before her own desires, a trait which is rare to see in YA literature. What sets this series apart for me is the creativity and imagery. Just the concept of iron fey is so unique and so well done that I look forward to each book to see what Kagawa will come up with next. The imagery of Faery and the way the fey royalty are characterized is excellent. I felt like I was really there with Meghan throughout her journey. There is a surprise at the end of this book. I did not cry (like many others have said they did) but I did say, "Hah!" kind of loudly as I was reading this book at the gym. Luckily, I don't think anyone noticed because everyone around me had headphones on. If you have not started the Iron Fey series yet, I would recommend the series as a whole to anyone. They are great reads! I did not like the way Kagawa handled the climatic ending. The power of Meghan's decision was tempered by the subsequent events. Beyond the creativity and imagery, Grimalkin is my favorite part of this series. I just love his quirky, snarky character. Don't you love when a book causes an emotional outburst? Nice review :) I like the pink cover too. I loved this book. Nice review! Oh! Thanks for keeping the review spoiler free because I dying to read this one, and I want to be surprised. Though I have already heard many people complaining about the ending. Thanks for the review, Kelli. I've been debating on whether or not to pick up this series. I leaning towards to it. Is this the last book in the series? Fabulous review Kelli, I can't wait to read this one! I'm so glad that Meghan grows up in this story, I love being able to see that progression from book one:) Now I'm all curious about the ending, I need to read this one asap! I seriously have to haul myself out of the woods and start this series NOW. Not tomorrow but NOW. Another one I keep hearing raves about it Nightshade and Nevermore. Ohhhh too many books too little TIME. I love Grimalkin too! I think he steals the show.